Saint John Joseph of the Cross was born on the feast of the Assumption in 1654, on the island of Ischia in the kingdom of Naples. From his childhood he was a model of virtue, and in his sixteenth year he entered the Franciscan Order of the Strict Observance, or Reform of Saint Peter of Alcantara, at Naples. Such was the edification he gave in his Order, that within three years after his profession he was sent to found a monastery in Piedmont. He assisted in its construction himself and established there the most perfect silence and monastic fervor. One day Saint John Joseph was found in the chapel in ecstasy, raised far above the floor. He won the hearts of all his religious, and became a priest out of obedience to his Superiors. He obtained what seemed to be an inspired knowledge of moral theology, in prayer and silence. He assisted at the death of his dear mother who rejoiced and seemed to live again in his presence, and after he had sung the Mass for the repose of her soul, saw her soul ascend to heaven, to pray thereafter their God face to face. With his superiors' permission he established another convent and drew up rules for the Community, which the Holy See confirmed. Afterward he became a master of novices vigilant and filled with gentleness, and of a constantly even disposition. Some time later he was made Provincial of the Province of Naples, erected in the beginning of the 18th century by Clement XI. He labored hard to establish in Italy this branch of his Order, which the Sovereign Pontiff had separated from the same branch in Spain. His ministry brought him many sufferings, especially moral sufferings occasioned by numerous calumnies. 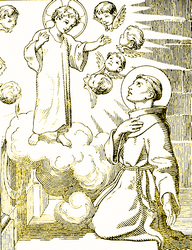 Nonetheless, the Saint succeeded in his undertakings, striving to inculcate in his subjects the double spirit of contemplation and penance which Saint Peter of Alcantara had bequeathed to the Franciscans of the Strict Observance. He gave them the example of the most sublime virtues, especially of humility and religious discipline. God rewarded his zeal with numerous gifts in the supernatural order, such as those of prophecy and miracles. Finally, consumed by labors for the glory of God, he was called to his reward. Stricken with apoplexy, he died an octogenarian in his convent at Naples, March 5, 1734. Countless posthumous miracles confirmed the sanctity and glory of the Saint, and he was canonized in 1839 by Pope Gregory XVI. Lives of the Saints for Every Day of the Year, edited by Rev. Hugo Hoever, S.O. Cist., Ph.D. (Catholic Book Publishing: New York, 1951-1955). Many sins are forgiven her, because she has loved much.